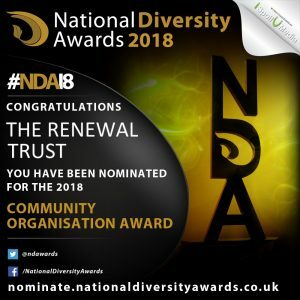 We’ve been nominated for a National Diversity Award for our Future Leaders of Nottingham programme – a city-wide positive action programme set up to make leadership in the city more diverse and representative of all communities, across the private, public and voluntary sectors. The programme, now in its third year, discovers and develops talented future leaders from identified under-represented protected characteristic groups including race, ethnicity, disability, sexuality and gender and gives them the chance to experience leadership at the highest level, while gaining the skills needed to become a leader – through masterclasses, placements, mentoring, coaching and peer networks. The programme is free for individuals, with places paid for by employers, so there’s no financial barrier to taking part. Now we need your vote please – to help boost our chances of winning an award. We’ve been entered into the Community Organisation category – which recognises individuals and groups who have made an outstanding contribution to their local community. You can vote here. Across the UK, leadership is still hugely under-representative of women and black, Asian and minority ethnic (BAME) communities, with just 6% of people from BAME backgrounds in top jobs and only 22% of women. LGBT+ communities face discrimination too, with a recent survey finding that over half of LGBT+ employees hide their sexual orientation or gender identity, because they think they won’t be considered for promotion or development opportunities. The business case for increasing diversity and representation is huge. Research by McKinsey shows that organisations with a gender-diverse board are 15% more likely to outperform their peers financially, and those with an ethnically-diverse board 35% more likely. We’re launching a new project – organised by Place, our community-led arts and culture programme.